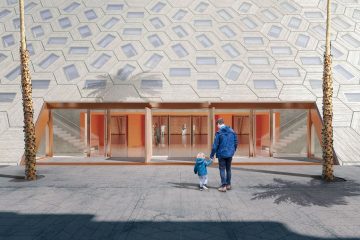 Pritzker Prize-winning architect Rem Koolhaas was chosen to design the Audrey Irmas Pavilion by a committee of Temple members and outside experts in architecture. Beginning with a list of 25 world renowned architects, the committee narrowed the field in a juried competition for this prestigious commission. For the first time, we are releasing segments of Rem Koolhaas’ presentation to the committee, which resulted in him being chosen to refine and complete his design for the gathering place we are creating for our members and the entire city of Los Angeles. 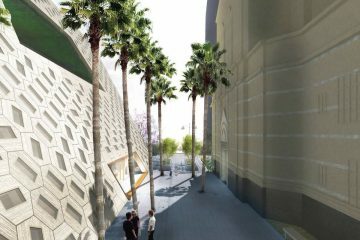 The vignette has Rabbi Leder asking Rem Koolhaas about how he thinks the building will be understood and experienced in 100 years. Imagine 100 years from now. Rem Koolhaas, pictured above with Shohei Shigematsu, answers in this video. 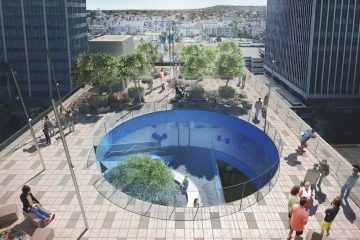 Rem Koolhaas and Shohei Shigematsu, from Office of Metropolitan Architecture (OMA), designed a building that will enhance Wilshire Boulevard Temple with a magnificent gathering space for member’s life cycle events and various conferences and galas, in addition to large scale support for those in need in our LA community. The Audrey Irmas Pavilion will feature a banquet hall with a seating capacity of close to 500 people, a commercial kitchen, a multi-purpose room and chapel, ten meeting/conference rooms with a sunken garden at its center, and a roof top terrace with views of the Hollywood Hills and city. I hope you enjoy hearing Rem’s viewpoint on the Audrey Irmas Pavilion.